Today’s post will focus on all the crazy amazing (yet nerdy) things we did in England! To preface this Harry Potter portion, I should mention why we even planned this trip in the first place. On February 14 2016 my dear husband Jonathan surprised me with my Valentine’s gift of tickets to Harry Potter and The Cursed child. 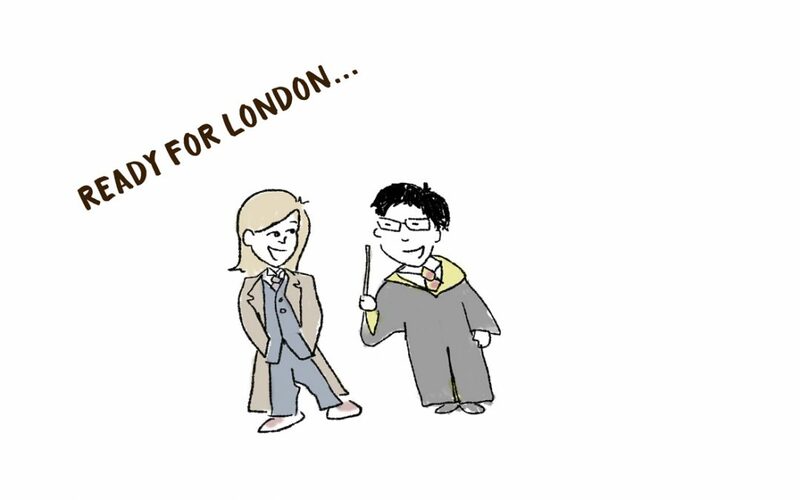 So for a little over a year we’ve been geeking out and planning the ultimate Harry Potter experience in anticipation of seeing the show in London. Re-reading the books (yet avoiding reading Cursed Child so we could be surprised at everything), rewatching the movies, and booking all tickets and tours was involved during this time. Aaaaand Fantastic Beasts and Where to find them also came out and we got to experience a new portion of the Potter universe. All in all, we were just a “tad” excited to experience everything and anything Potter. Now filming was strictly prohibited inside the theater so we don’t have any footage of the play but we can definitely say it took our breath away. The special effects and staging in particular were especially magical and left us wanting to sit in the theater for days on end. And seeing our favorite trio all grown up?! Incredible! Ron, Hermione, and Harry all lived up to the life I would want them to have after book 7 closed. It was a truly magical experience for a Harry Potter fan and we will #keepthesecrets and say no more about the plot of the wonderful play. So all in all, what did we learn about Joy on this particular portion of our trip to England? -Find others who share your fandoms, your interests, and weird likes. Geeking out together is one of those sweet joys in life that can only come when we aren’t ashamed to say we love something and don’t care what others think of us because of it. When nerds are together, it just feels like we’re all cool. -Joy is often found in the kindness of strangers. When you are traveling in a foreign country you are often at the mercy of the people who live there. Smiles, kind interactions, and positivity really made our day and helped us to navigate an unknown city so much better. It reminded me how much I need to remember kindness when foreigners are trying to navigate our home here in the States. Helpfulness begets joy and makes the world a better place to live in. Shortly after we left London for Paris, terrible acts of terror occurred at Parliament and several victims were killed and injured. We were shocked to learn this happened and our hearts went out immediately to all the families who had loved ones who suffered because of the attacks. If timing was just slightly different, those victims very well could have been myself and my family. People were there just like us: enjoying a dream vacation… or passing by on their way to the metro…some were just there doing their jobs… No one deserves to die or suffer because of one persons selfishness and hatred. This all hits very close to home since we were so close in timing to being in London during this occurrence.